The Apple Watch has numerous health and fitness related features including a heart rate monitor and built-in step counter, also known as a pedometer. While many users assume the pedometer feature must be accessed from the accompanying iPhone, which can also track steps and mileage on it’s own, there’s actually a separate pedometer feature bundled into the Apple Watch Activity app that is largely overlooked by users, accessible directly from your wrist any time. If you want to see how many steps you’ve taken and the distance traveled while wearing an Apple Watch, you can quickly look at the step counter on the device without having to use the paired iPhone. The Apple Watch pedometer will update the step count even if the paired iPhone is not in reach or unavailable, and the data will sync to the related iOS Health app when the iPhone is in range again. It’d be nice if the Apple Watch had a glance view or complication (the customized settings on the clock faces, complication is their name and not a problem) for the pedometer feature, but for now you can quickly access it from the Activity app. For users who don’t have an Apple Watch, you can still track steps and mileage on the iPhone as well using the devices accelerometer, as long as the iPhone is with you while you’re walking around. Like the Apple Watch, the step counter is enabled by default on the iPhone but if you turned it off you can turn it back on again to track motion and fitness with the phone. Apple Watch is a great accessory for active people and also for those looking to increase their activity, with hourly Stand Up reminders to help minimize sitting, various fitness and health tracking features, a heart rate monitor, calories burned estimator, and much more. I just use Health app on my iPhone and read it from there. Apple Watch estimates higher than Fitbit it seems. The Apple Watch does not keep steps correctly, with or without the iPhone. Try walking through Costco or a supermarket pushing a cart and if any steps are recorded. The Apple Watch has an activity complication, contrary to the author’s assertion, that can be added when customizing a watch face from the watch UI. I enabled it in mine and it works fairly well. I just checked and it has recorded 3,771 steps or 2.12 miles. I know that I ran 1.7 miles of the 2.12 so the only question is how accurate the 0.52 difference is, and when/how that occurred. Undoubtedly, the app’s accuracy will improve over time as Apple is able to gather and analyze metrics. Calculating human body movement and activity from a single body location (wrist) is not trivial and will take time to refine and optimize. 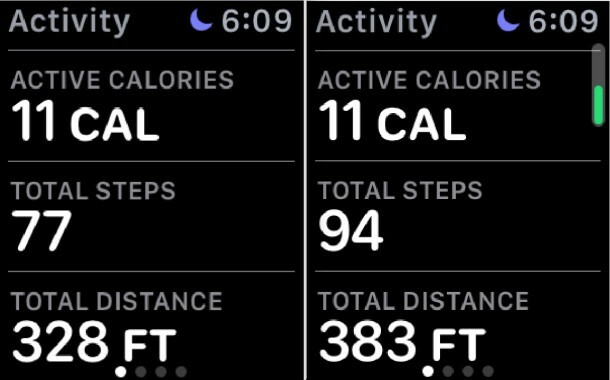 Correct, the Apple Watch has an Activity complication, but it doesn’t show step count or distance, it only shows the Activity rings giving a vague idea of the goals for the day. It’s useful, but it would be nice to have a quick glance for the pedometer or a complication for it. did you NOT read this blog? 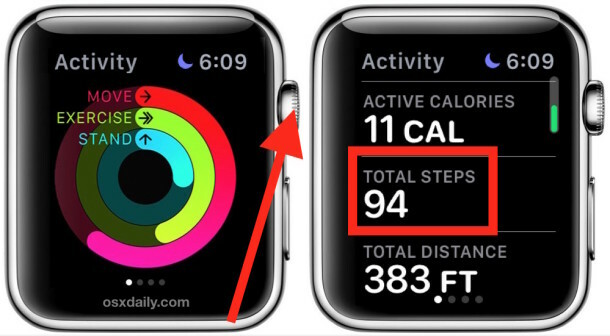 Why is there a difference between the 2 pedometer total steps on the Apple Watch? Under ‘Steps’ it says you’ve walked 383 FT! Mine says KM, I want it to say MI – how do I change it? What most of us are saying is that we DONT want the ring complication on the face… we would like to have a complication for steps only… it would be nice if Apple could get their act together because their pedometers are not accurate as I’ve tested my watch and my Fitbit together on many occasions. I really prefer my Apple Watch but it’s lacking on one of the biggest health kicks right now! It would be nice to just look at your wrist and see the total steps just like you see the time or date. I just bought my watch today and have worn it all day and it still says 0 steps. Why is it not recording my steps? My step count is WAY OFF. I was drying my hair with my watch on and it recorded almost 200 steps. Which is frustrating because I got the watch to be a fitness tracker. Also if I’m rolling around playing with my kids on the floor it also records steps?!? Anyone have an idea how to fix this? Or reset the count for the day? How do you reset the pedometer app to zero ? I just purchased a I watch 2. I can’t get it to record my steps . Timer starts but nothing counts? Any ideas? How can I find out the total number of steps I have done in a month on my iwatch or my iPhone please? I have been in touch with Apple about my watch. When I knit or crochet it records my wrist movements as steps. I can easily notch up 5000 steps purely by sitting crocheting. Apparently there is nothing they can do about it as it’s all recorded by the wrist movement. Sadly for me this renders the Watch useless as a fitness feature. Maybe take your watch off while knitting or crocheting? I walked for about 4 hours pushing a cart and logged on 0 miles. It can be frustrating. Calibration may improve your step accuracy. Pedometer++ is a free app which brings with it a complication where steps can be seen on the watch face depending which face you use. I recommend the bottom long complication with say the Analog Activity face….Or Mickey Mouse, a good walking partner. Can you compete against your friends on who has done the most steps for the day etc , even if they have Fitbits or other brands ? I was tired asking for people on how to do setup my apple watch. Here is where I got all my questions answered – The best facilitator I ever met. I have tested my watch many times and for outdoor walking it is consistently short in distance by .15-.20 of a mile every mile. It never comes close to Fitbit, which is much more accurate. I have iWatch 3 and latest update. It also is often way off from iPhone on the same walk. I can find no way to correct the calibration.